As we've been slowly putting the house together we've found the brass plating has worn off the door hinges. Also, in the past a few of them were replaced so the different halves don't always fit together. And, of course, we didn't always keep the halves together because quite often the door half was painted to the door and went in with the door for paint stripping. Anyway, as we're rehanging doors, the hinge parts don't always fit together. It can be frustrating trying to dig through the box of old hardware trying to find matching sets. And I'm thinking some of the pieces may have gone missing as we don't seem to have enough pairs. Sure, we could pull all the hinges and lay them out and get them all matched up again, but I really wanted to replace them anyway. So, last month I went looking for the best brass ball-tip hinge deal I could find. The Old House Online website had a list of hardware suppliers and I found a mention of Taamba Heirloom Hardware, which is the brand I ultimately ended up buying. 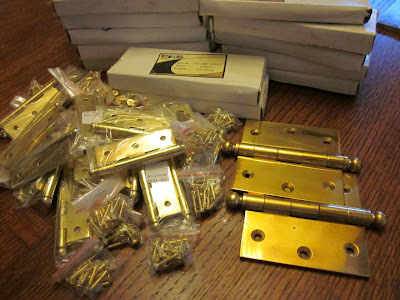 The small brass hinges are for the new cabinet doors for the linen cabinet and they came from HardwareSource.com. (Solid Brass Hinges with Ball Tip.) We're also going to go ahead and replace the cabinet door hinges on the main floor because the guys doing the staining covered them with red stain. They didn't look good to begin with, so this provided an excuse. I do like my shiny brass hardware . . . I also bought brass-colored closet rods and flanges, but they're still in the box. I'm so hoping we can also get the closets finished by the end of the year . . . We have so many projects in the works right now, it's a little overwhelming.